Anyone with information is asked to send it in. See CONTACT page for details. Spoke to a Pruskin einikel last night, R’ Wolf Lifshitz z”l never married, he was very wealthy – mostly from his father’s inheritance – and he left all his money to Chinuch Atzmai. is this his father the Rav of Toronto? 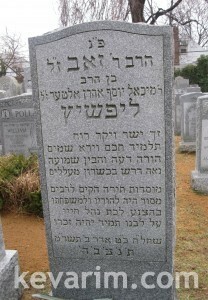 And this have to be to the image of the grandfather of rabbi zeev.